From San Francisco, Bootie creators A Plus D! For over a decade, Bootie – the world-famous mashup party – has been spreading mashup culture across the globe. 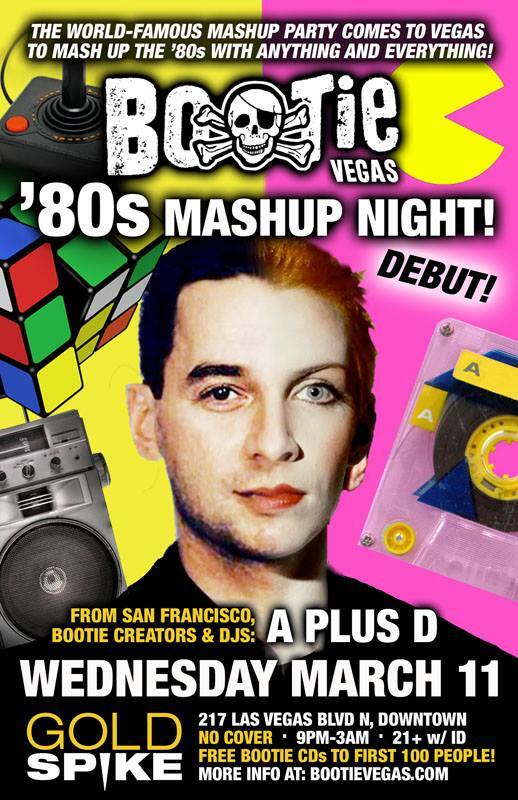 Now, the party finally comes to Las Vegas, riding a radical wave of bitchin’ nostalgia — it’s ‘80s Mashup Night! Settling in at downtown’s newly-renovated Gold Spike, Bootie pulls out all the stops for a cover-free mashstravaganza, as we encourage you to pull out your neon colors, awesome leg warmers, big hair, headbands, black-and-white Vans sneakers, and big plastic jewelry – because this is going to be a rad retro party, done up Bootie-style! Bootie founders and DJs A Plus D, aka Adrian and Mysterious D will mix and mash the best ‘80s music from every genre, combining them with songs from every era, all night long! It’s the ‘80 all over again, but all-new! Free Bootie CDs to the first 100 people! Bootie 101: What IS “Bootie”? With your professors A Plus D….